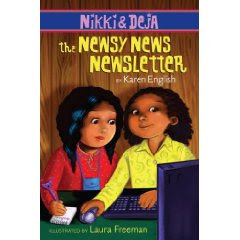 Nikki & Deja: The Newsy News Newsletter by Karen English. Illustrated by Laura Freeman. Clarion Books, an imprint of Houghton Mifflin Harcourt Publishing. January 2010. Reviewed from ARC from ALA. These look really cute! Hadn't seen these before, thanks. How adorable are these books!!! So books with African-Americans on the cover really are selling. Shocker there. Can't wait to get my hands on these... I'm anxiously awaiting their arrival! Love series that are captivating to the middle-elementary (reluctant readers) level! Oh, I need these in my library. Most of my readers are reluctant or non-readers. I love the Nikki & Deja books. Just brought Keena Ford and the Second Grade Mix up by new author Melissa Thomson, illus by Frank Morrison. I love his work.